Sometimes you just have to keep things a mystery. 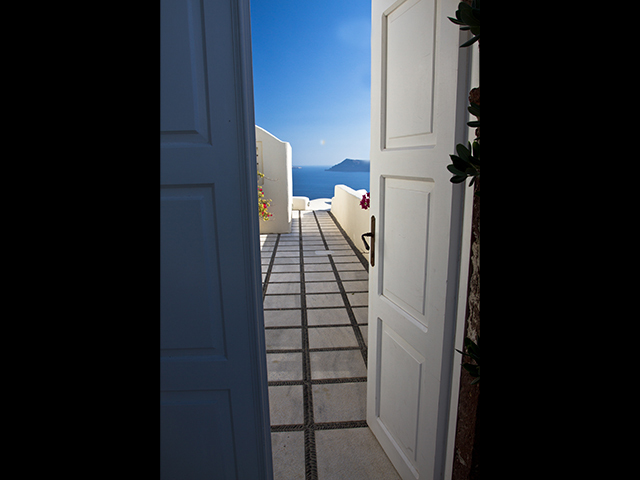 So as I wandered around Santorini, and I saw this beautiful scene through the half open door way, I did shoot this picture. But I didn’t go around to see what else was back there. Haha, I’m just kidding. That’s a sweet concept, but I was HOT! I didn’t want to get out of my little safe haven of shade! I would get married on Santorini (just so any would-be suitors out there know), but I would not do it in July in the middle of the afternoon in the sun!